As soon as I saw this recipe, I KNEW I had to make it. It had everything I love, in one bowl. 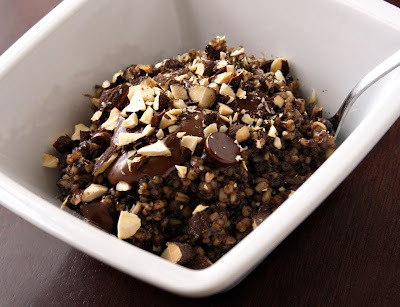 Chocolate, espresso, steel cut oats, almonds, and nutella. Okay, so the nutella was my addition, and WOW was it a good one. With a stir of my spoon I got a breakfast that tasted borderline like a dessert, but was rich, healthy, and filling. Bring water to a boil. Stir in oats, salt, espresso and cocoa powder. Bring back to a boil and reduce heat to medium-low. Simmer uncovered for 20 to 30 minutes, stirring frequently, until the oats reach your desired consistency. Remove from heat and stir in the sweetener. Transfer to bowls and add toppings. Amazing! I am in chocolate heaven! Holy yumminess!Now that is my kind of breakfast! I have been both oatmeal and nutella crazy lately. Wow – it's like you read my mind. I am making this tomorrow morning! This does sound delicious seeing as how my chocolate tolerance is now sky high. I bet the MaraNatha dark chocolate almond butter would be fantastic with it too! What a perfect breakfast! This looks delicious! HOLY MOLY! That looks awesome! 🙂 I'll be having this for breakfast VERY soon! that looks DELICIOUS!! I don't know if I could make that and not HAVE to have it for breakfast EVERY day! YUM! Talk about not having to feel guilty about dessert! Now this is the type of oatmeal I could eat for breakfast! Delicious! Holy cow! That looks so good! I had instant oatmeal this morning, and I was thinking as I ate about how I need to make oatmeal from scratch instead of eating the not-so-natural packets. Maybe this is a good place to start! 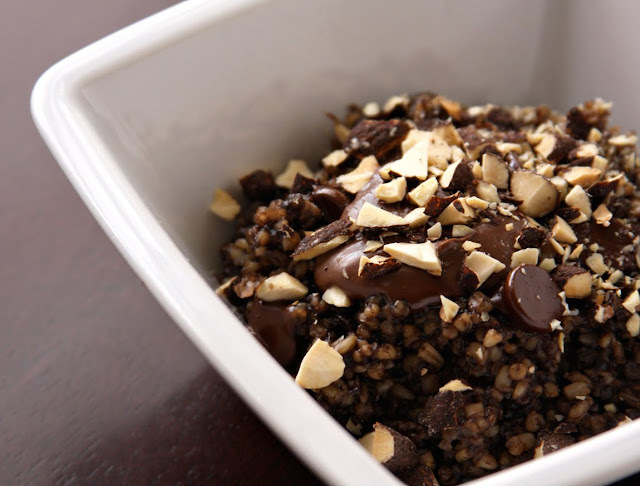 I love the idea of adding espresso powder to oats for an extra morning jolt. Genius! THIS LOOKS AMAZING! I seriously think I just drooled on my screen! YUM! I'm in chocolate heaven! This will sure satisfy my sweet tooth. just got some steel cut oats…now I know what I’m doing with them! thank you for the lovely morning treat! i added peanut butter instead of nutella since i had it on hand and honey instead of the sugar – delicious! This looks great! Not quite breakfasty, maybe more dessert? I’ll have to try it out soon! I have been doing baked oats and thought of nutella but haven’t done it yet. I will add this to the list as this looks amazing!